How could something that’s so comforting and soothing, like a nice, warm bath, be one of the biggest dangers to older adults? The truth is, combining smooth surfaces, slippery soap and hot water create the perfect storm for a fall danger – one of the most severe risks to aging adults. 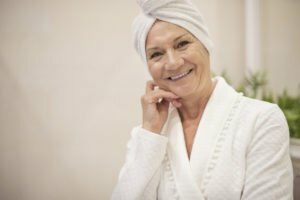 January is designated as National Bath Safety Month, and it’s a great chance for both education and assessment to ensure the utmost bathroom safety for your senior loved ones. Simple, basic commodes can cost anywhere between $60 and $250, although more complex, specialized commodes, such as those that have tilting mechanisms, can run as much as $3,000. AARP also provides a beneficial bathroom safety checklist with design directions which will help seniors and their families make the most appropriate home modification decisions. Hired Hands Homecare in California can also help with bathroom safety for older adults. We can provide an in-home safety evaluation and guidelines, and by providing expert, hands-on help at bathtime, can help ensure that seniors remain safe throughout all of their bathroom needs – always delivered with the utmost respect and regard for dignity and privacy. Contact us at 866-940-4343 for more information.